Our 2019 oilseed workshops were a great success with more than 250 individual attendees, including 100 growers and industry reps who attended for the first time. The Wilbur workshop had 135 attendees and Clarkston 150. Many thanks to all of the presenters, planning committee members, local help in setting up and cleaning up, sponsors, and all who attended. We will be working on posting presentations as we receive permission. In the meantime if you have any suggestions, comments, or questions about the workshops please email ksowers@wsu.edu. All signs are pointing towards a potential significant increase in spring canola and other oilseed acreage not only in the PNW but also the Northern Plains and Canada. While that is great news, it may also result in spring canola seed being in short supply. We encourage you to make crop rotation and variety decisions early, and contact your seed suppliers soon about early purchase discounts. We have updated our list of suppliers in the PNW available on our Production Information page. If you have questions about variety selection, or additions or corrections to the supply list please email Karen Sowers. WSU and University of Idaho have released final yield results for winter and spring canola variety trials. When making variety selection decisions be sure to consider herbicide history, weed control needs, yield goals, crop rotation, residue, and other factors specific to your farm. Yield data from previous years trials in WA and ID and the National Winter Canola Variety Trial can be found on the Production Information page. If you have any questions about variety selection, planting, or other topics please email Karen Sowers. As of November 1, 2018, Viterra has announced that it “has acquired full ownership of Pacific Coast Canola, an oilseed processing facility located at Warden, WA. Viterra intends to fully integrate the facility into its asset network and will be implementing the Viterra brand across the business over the next few months. 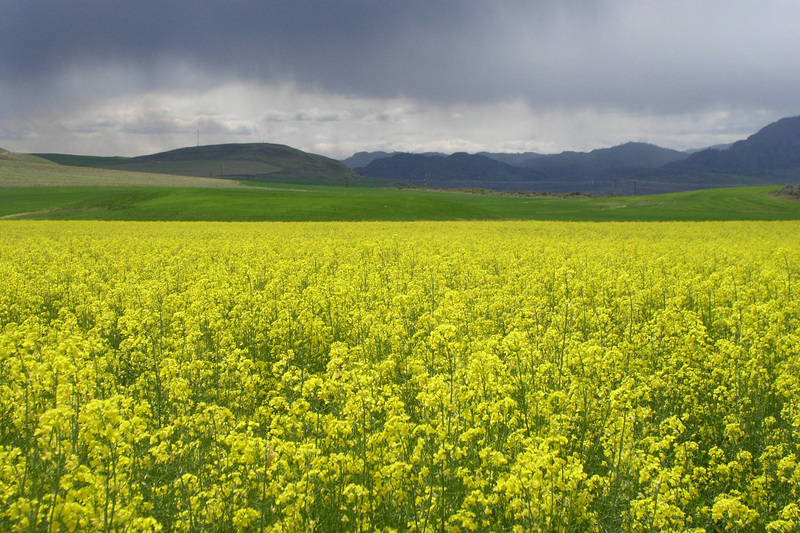 Producers, industry, and agencies who have an interest in canola and the betterment of the canola industry are all eligible for membership in the Pacific Northwest Canola Association. For more information email the Association. Check out this great paper “4R nitrogen management when integrating canola into semi-arid wheat” about nitrogen management of canola in a wheat/cereal rotation, published recently in Crops & Soils Magazine. WSU-WOCS, OSU and UI faculty and grad students are the authors, and the information is based specifically on PNW canola research. The Canola Council of Canada has developed calculators to help growers set seeding rates and plant stands that match seed size, risk factors and estimated seed survival. Check out the calculators on the Canola Council of Canada site. The Extension publication “Enterprise Budgets: Wheat & Canola Rotations in Eastern Washington Intermediate Rainfall (12-16″) Zone (Oilseed Series)” is available. This budget and the accompanying low rainfall version of the bulletin are powerful tools to calculate and compare the short and long-term economics of including canola in a cereal rotation. For the accompanying Excel spreadsheet for either rainfall zone, please email Karen Sowers. The Washington State University Oilseed Cropping Systems Research and Extension Program, in partnership with the Washington State Department of Agriculture, is committed to supporting the grower and industry-based movement to diversify cropping system agronomics and markets through increased adoption and production of oilseed crops.